This could be tricky! Voting commences by September 14th and closes on the 21st. The winner will be announced by September 28. I'll surely blog with details on the voting in a few days, and also regarding the magic of Brisbane Twestival which was on last night and ABSOLUTELY BRILLIANT. Edit: Voting is open. You can only vote once, so make it count; vote for me! We are seeking one lucky charity, a kick-arse venue, charming sponsors, wicked bands, entertainment, artists, stalls, web masters, event gurus, stage managers, admin and general awesomeness for this event. 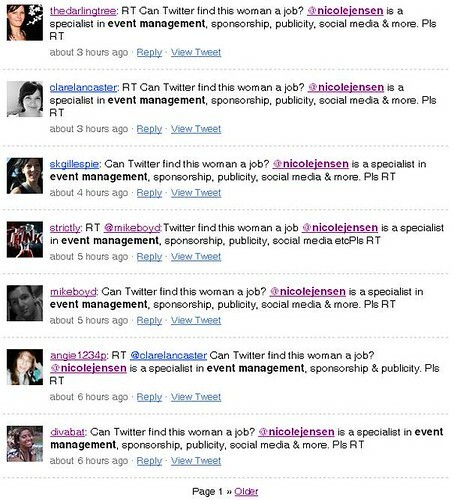 Please e-mail me at events@nicolejensen.com if you would like to give a hand or offer up some contacts for us. Lastly, I came across this useful article on how to secure a sponsor for an event. It's pretty cool.